The Reason I Jump: The Inner Voice of a Thirteen-Year-Old Boy with Autism by Naoki Higashida is like a Rosetta Stone, a secret decoder ring for autism’s many mysteries. 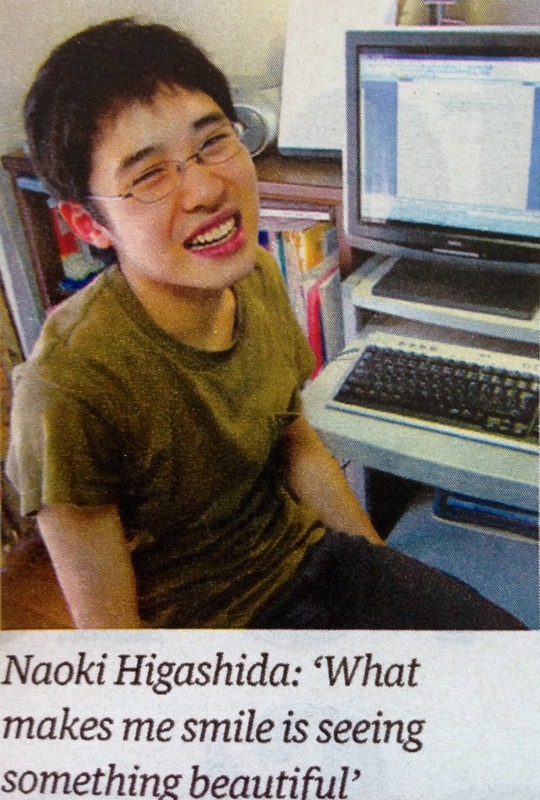 Author Naoki Higashida is a non-verbal boy with autism living in Japan. He’s able to write using a letter board, and this book of essays was published in 2006 when Higashida was 13 years old. Higashida’s answers show amazing insight into the autistic mind, detailing a unique system for filing memories, as well as a perpetual struggle with sensory input, and the concept of linear time. The mental gymnastics needed to overcome autism’s obstacles are tremendous, and sometimes brilliant. But it’s exhausting being inside Higashida’s head — you can only imagine how he must feel. Many of Higashida’s introspective insights are universal, and written with a poet’s hand. Invisible things are hard for all of us to grasp. Thoughts, emotions, memories, and faith; germs, virus, and disease. Our lives are ruled by Invisibles. They get us all in the end. Higashida’s apologetic tone resonates throughout this collection. He longs to connect, but he knows his strange behavior makes others uncomfortable, and it breaks his heart. It will break yours, too. But The Reason I Jump is a double-shot of hope for parents of children with autism, especially those of us raising non-verbal / limited-speech kids. This book is proof of what we’ve known all along — our kids are thinking / feeling / loving people trapped inside uncooperative bodies. They wear their skin like an ill-fitting suit, constantly tripping on the hems, and getting caught up in the sleeves whenever they reach for something. Sensory Integration Disorder and the strange wiring of the autistic brain makes connecting with the outside world a challenge for our kids. Higashida says the autistic mind focuses on details (flashing lights, a ladder, hoses, black tires, loud siren); while a typical mind will immediate recognize an object (a fire truck). Higashida sees a benefit in this reverse-engineered view of the world. Connect with a person with autism — see the world through their eyes — and you’ll be blessed, too.